Remembrance Day always makes me think of the service of my British grandparents, Vic and Sylvia Parker. This year, it occurred to me that we always hear about the war in terms of the battles and the conflicts, but not about the personal stories of the participants. With that in mind, I’d like to share with you how the war brought my grandparents together and how their lives unfolded. Grandma got called up to serve in the Women’s Auxiliary Airforce (WAF) and had to report for duty the day after her 18th birthday. She immediately started basic training and driving school in the North of England learning to drive and service trucks in the days before starter motors or clutch peddles. She was a motor transport driver who drove the pilots to their planes, which were hidden under tree canopy to avoid detection. Grandpa served as an officer in the Royal Air Force (RAF) as a bomber pilot. They met at a dance on the WAF site and from then on, more often than not, Grandpa sat in the front row of the bus to be be near Grandma, who transported the pilots to their hidden planes. They were married within the year on March 4th, 1944.. She was 19 and he was 28. The rationing of butter, flour and sugar during the war meant that they were in very short supply. Grandma’s step-mother had her friends save up their butter and sugar so that she could make a wedding cake, though she laments that it wasn’t iced, as there was no icing sugar available during the war. She couldn’t have a white wedding dress, but she was able to get a new blue suit with a tan blouse and tan hat with blue ribbon. Grandpa wore his dress uniform. A honeymoon in the Lake District was cut short after four days when Grandpa got a telegram informing them that he was to report back to base for a new assignment. Once married, Grandma had to move 12 miles away to work on a different base since Grandpa was an Officer and she was not. Every morning after a night flight, Grandpa would bike back to the B&B that was their home. Grandma worked at that base until the war ended in 1945. By then she was expecting her first baby, my mother, Ann. Women in service were expected to resign and take care of their children, and that’s what Grandma did. She also bred, raised and showed many litters of Boston Terriers and Boxers while raising three daughters, and was an avid seamstress and knitter, forever with a charity project on the go and a delicious meal on the stove. They both enjoyed gardening, a hobby my mother and I have inherited. Grandpa was awarded medals including the Distinguished Flying Cross for outstanding action and sustained effort in battle, the 39-45 medal, and the Africa Star for his North Africa service. He also did one tour in the Middle East in a Wellington Bomber. He was also sent to learn to fly Mosquito Bombers and posted onto squadron in Norfolk on east side England. After the war, Grandpa worked for the Civil Aviation Authority regulating commercial flights and licensing pilots. He also aided in the design of airports, including London Heathrow and Gatwick, before he joined the foreign office as civil air attaché in Beirut, Lebanon and in Bonn, West Germany during the Cold War. There he worked with John le Carré, the author of British espionage novels. He also worked with the head of the intelligence agency MI6 at the time. Everyone always joked that they were spies, but I am assured that this was not the case, at least for Grandpa. When we would visit them, Grandpa would tell stories about his planes. 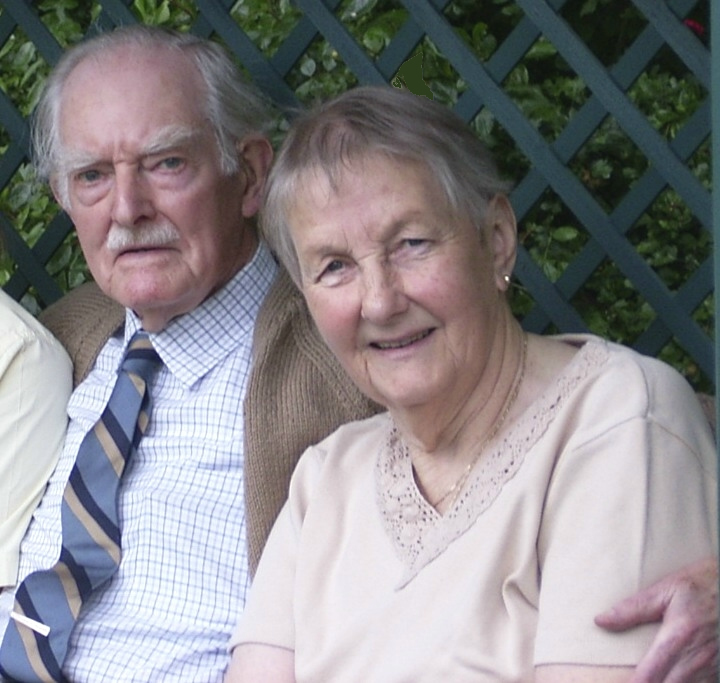 They kept in touch with several friends from their time in the RAF over the span of their 66 year marriage. Grandpa was a man who had a passion for life long learning on several topics, and always kept a dictionary and several reference books by his side. He and Grandma ensured their daughters had access to the best education. He loved marmalade on toast and was very proud of his daughters. He took great enjoyment in seeing his 8 grandchildren. Though an ocean separates us, I was fortunate enough to see them often enough to have a relationship with them, as well as with my English aunts, uncles and cousins. The second world war seems so far removed from my everyday life. It’s difficult to fully grasp what life must have been like during the war, and indeed in a war zone. As all WWII veterans are aging and passing on, it’s important to honour their contributions to life as we know it in Canada and to learn their stories. My Grandpa Vic died at the age of 95 in his own home three years ago. My Grandma Sylvia is now 89 years old and stills lives in their home in the village of Paulerspury in Northamptonshire, England, though she decided to give up driving after 70 years, two years ago. When I attend the Remembrance Day ceremony at the cenotaph this November 11th, I’ll be paying tribute to my Grandparents’ contribution during WWII, as well as to the many others who did not survive the war.